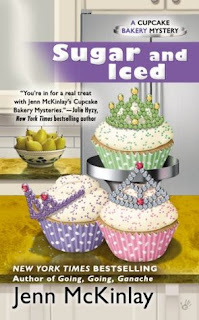 Sugar and Iced is book 6 in the Cupcake Bakery Mystery series. I'm skipping around this series like crazy, I've gone from book 4 to 3 to now 6. I've really been enjoying the series and plan on get more of the books soon. As I mentioned in last week's review, these can be read as standalone novels due to the author including enough details about each character. If you're reading these out of order like I am, you will see some spoilers from the overall series story arcs but the actual plot for each book changes with a new mystery so you won't miss much. In this installment we have Melanie Cooper and Angie DeLaura reluctantly agreeing to have their bakery, Fairy Tale Cupcakes providing cupcakes to the 75th annual Sweet Tiara beauty pageant. They know it will bring good publicity and drive business to their shop but Melanie doesn't really enjoy the pageant scene. With the help of Melanie's mother, Oz's friend Lupe enters the pageant in an effort to earn a scholarship. One of the judges seems to have it out for Lupe from the start and when the judge winds up dead, Lupe is the prime suspect. Melanie and Angie are determined to figure out who the real killer is while keeping up with the cupcakes they have to prepare each day during the pageant. In this installment I had a slight inkling on who was behind the murder and wound up being right. It was still a really enjoyable read, though I do tend to like when I can't figure out the killer until it's revealed. Sugar and Iced brings another solid addition to the series that I'm quickly becoming addicted to. I've really been enjoying this author's writing style and can't wait to get more books from this series. There's strong friendships between the characters and the mystery almost always stumps me and I can't wait to see how it all pans out. The romance element in this particular novel left me a bit wanting but this is a mystery book not a romance. All in all, if you enjoy whodunits or books that include cooking/baking you'll love this series. Susan Boyce did a wonderful job as always in her narration. I don't think I can switch formats on this series anytime soon since I love how she brings them to life. How cute is that cover? Sounds like a good story. Love the cover!! And the series sounds fun. I've been enjoying the series so far, can't wait to see what happens in book one hahaha Figured I'd actually go back to the start since I've been skipping around the series like crazy. :) I'm starting to really love this genre, gonna have to try more soon! The cover is divine. I see you are having fun with the series. Great review. Sounds like a cute series. Looking at the cover, you wouldn't expect that it's mystery. Sounds really good. I've just finished a romantic suspense/mystery book. It made me miss my old lover (mystery/thriller books). I'll definitely check out this book (the book version).